Looking for a no-hassle way to connect your high-power external devices to your MacBook or PC? Transform your laptop into a multi-functional technology hub with the SideGear Pro USB-C Travel Hub. Featuring a convenient plug-and-play design, our dock instantly gives your Mac or PC so much more capacity with seven additional ports. Great for business professionals, avid travelers and photographers. USB-C Input for Power Delivery Keep your laptop and your power-hungry devices charged up, with up to 60W power delivery pass through. The HDMI port delivers ultra-high-resolution 4K@30Hz video signals to any HDMI-enabled device, such as a monitor display, projector, or HDTV. Your USB-C hub is designed to complement your Laptop, with glossy black finished body, and thin profile. It's lightweight & small - but packed with power. Traveling for business or a photo shoot? Your SideGear Pro USB-C Travel Hub easily travels with you, thanks to the lightweight ultra-thin design. Slips easily into a briefcase or laptop bag. 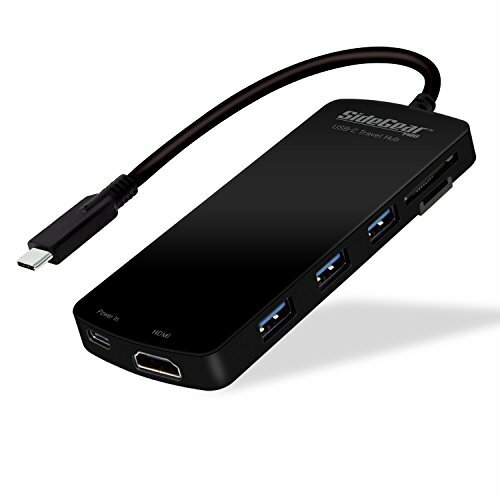 Expands Your Laptop Capabilities: This USB C Hub lets you charge your compatible laptop while using peripherals like external hard drives, USB flash drives, SD, microSD, iPhone, iPad & more. Packed With Powerful, High-Speed Ports: 7 ports in a compact Travel Hub Adapter comes with One USB Type-C Power in for power delivery, one 4K HDMI port, three USB 3.0 ports, & SD / micro SD card slots. Plug & Play Design: Simply insert your USB C adapter into your Macbook or Windows PC and it's ready to use. No software, drivers, or complicated installation process required. Sleek, Modern Look: Your Travel dongle features a premium, glossy black finished body to complement your laptop. Made of durable, high-quality materials. Take It on the Go: Traveling for business or a photo shoot? Your SideGear Pro USB-C Travel Hub easily travels with you, thanks to the lightweight ultra-thin design. Slips easily into a briefcase or laptop bag. If you have any questions about this product by SideGear Pro, contact us by completing and submitting the form below. If you are looking for a specif part number, please include it with your message.